Review: ALCATEL One-Touch 918N Glory” Dual-SIM Android Phone | iStoryang HaaayTek! I’ve just got a short-time peeking on the newest Dual-SIM Android touch phone in the Philippine market today–the Alcatel One-Touch 918N Glory. It’s another dual-SIM touch screen phone using the Android OS. Other most notable brands and models in this type of phone are the Samsung Galaxy Y Duos, my|phone A818 Duo and some models of Cherry Mobile . Off-hand this phone is better than the my|phone A818 Duo considering it can connect to the net via 3G. Playing games on the 918N Glory could be more exciting using the G-Sensor. One unique feature of the phone is the built-in Chrome browser. The capacitive touch screen of the Glory is quite responsive but i haven’t had a longer time using it. However, this video review of the Glory shows a good impression of the responsiveness of the screen when games are played on the touch screen. Both SIM are active as seen in the status bar but only one network is connected to a 3G network at a time. The Glory has convex back with a rubber-feel matte finish which gives a good grip in the hands. 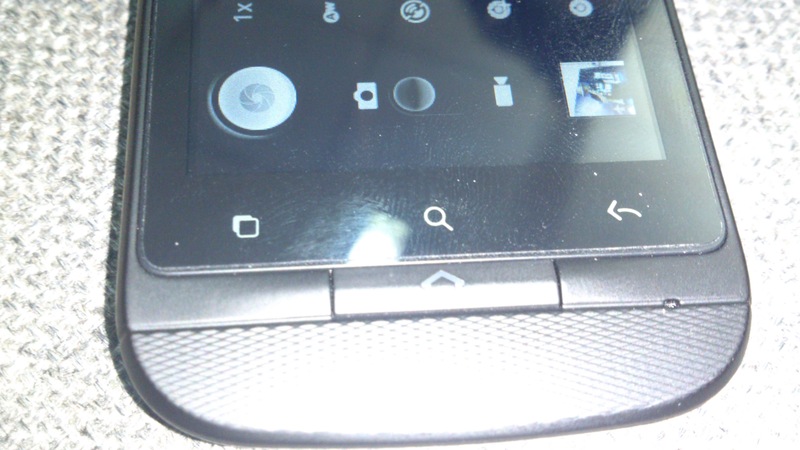 The 3.2MP camera and the LED flash are prominently located at the upper center. One shortcoming of the phone with a size like this is its on-screen QWERTY keys while the phone is on portrait mode. It’s just too close to press. Better use the keypad keys when in portrait mode and QWERTY in landscape mode. The Alcatel Glory has 3 touch buttons (Menu,Search,Back) and 1 physical Home button. 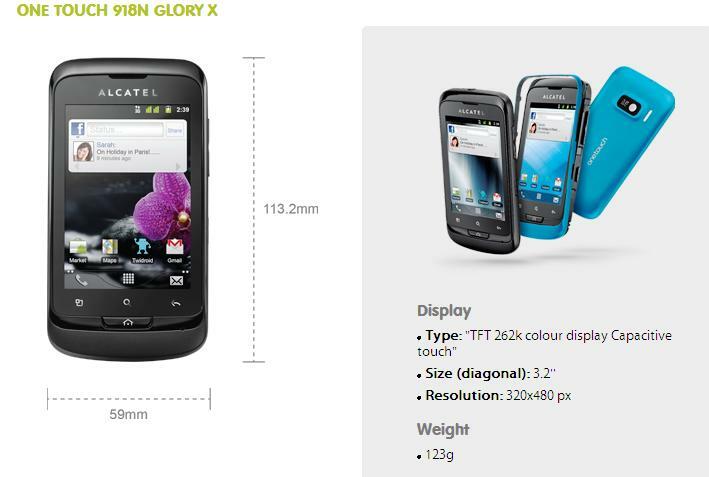 The right side of the Alcatel Glory has the power button and the Volume rocker. On its left side, is the mini USB port while the 3.5mm input jack is at the top. 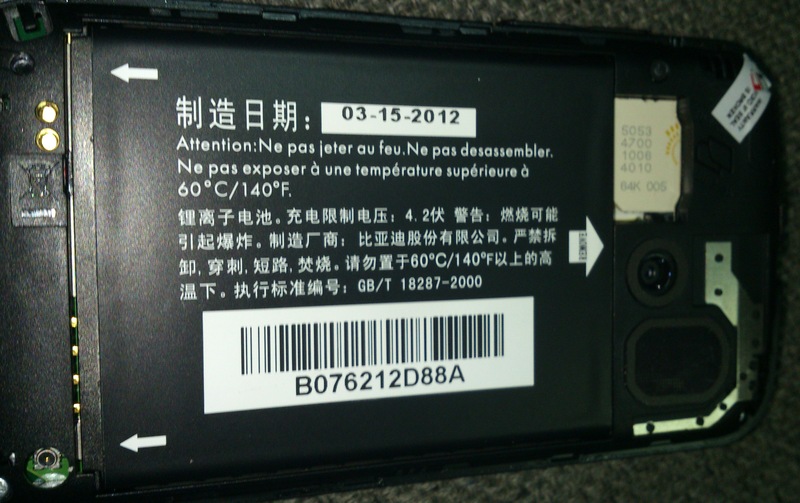 The microSD card is under the battery pack while two SIM cards are placed one on top of the other similar to most Made-in-China phones. 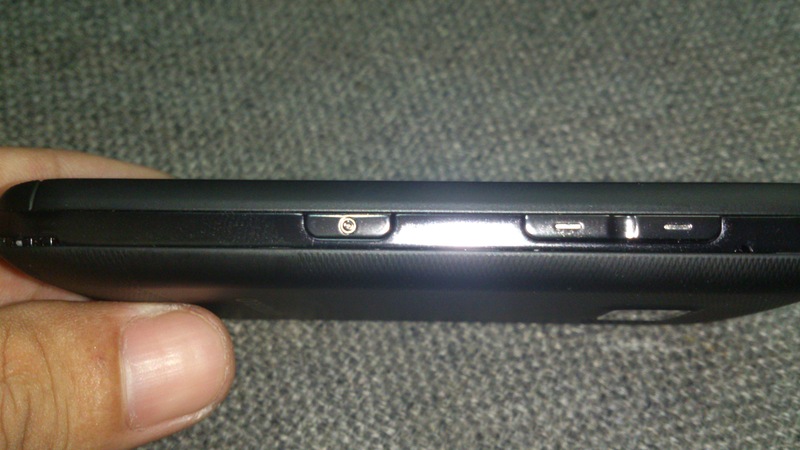 To the right of the SIM card slots is the 3.2MP camera and the speaker. 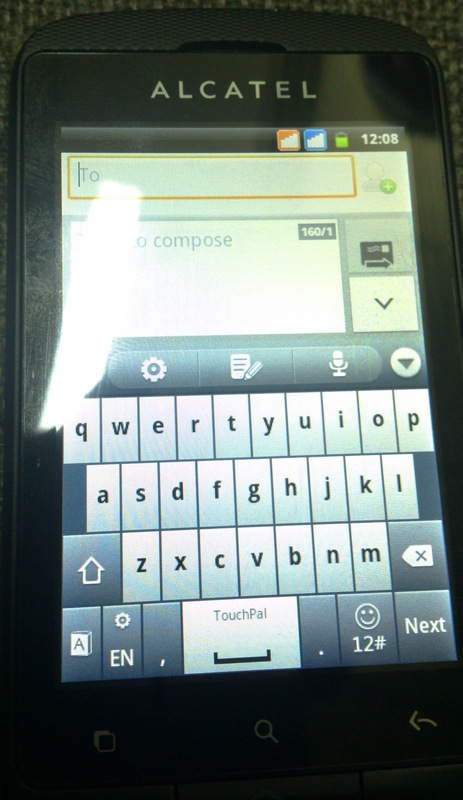 The Alcatel Glory on landscape mode with the QWERTY on-screen keyboard. I just got today (October 30, 2012) my personal unit of the Alcatel One-Touch 918N Glory packed with my new Sun SIM and my PLDT Landline Plus SIM. I’ll be updating this post hence i’ve now a unit that i can review for a long period of time. This phone has been the subject of several online forum discussions and the feedback is good. Anyway, here’s my own full-length observation of the 918N Glory which i am updating every now and then as soon as i get new experience of the phone. 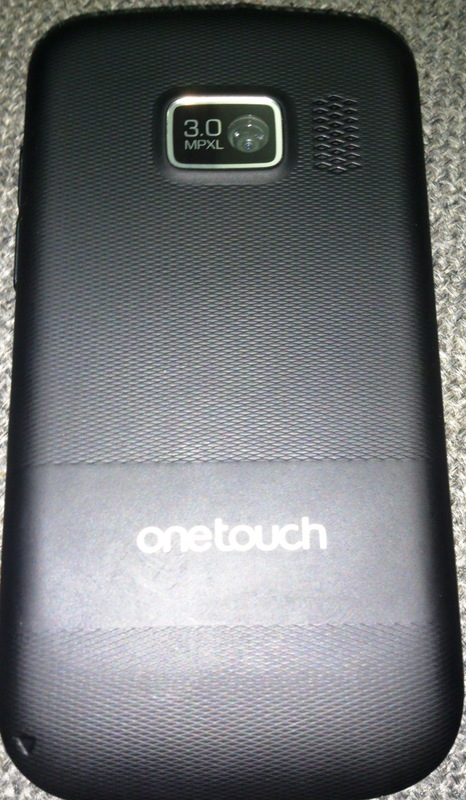 Unboxing my new unit of the Alcatel One-Touch 918N Glory. Raw shot is taken by the Glory itself. SMS messaging on this phone is great except for some mistypes on the period (dot) button which is difficult due to its proximity to the space bar when using the Touchpal keyboard (you can toggle between Touchpal & Android keyboard). I’ve some periods in between words because i always end up pressing the period when trying to tap the space bar. The LED light notification in the front panel doesn’t require the phone to always have the alert sounds whenever you have unread messages or notifications. The Android UI works perfectly here especially its immediate access to connectivity functions like WiFi, Bluetooth, Data Connection, and Airplane mode. Over WiFi, there is no hitches while streaming YouTube videos. Power consumption while the WiFi is on is very considerate that i only consumed one-fourth of its power for a half-day surfing over WiFi. This supports HD voice with its built-in AMR-WB technology. However, to date only Smart network has offered the HD voice in Makati City area. This is the reason why talking on this phone is awesome. The voice quality is good hence i am using Sun and PLDT SIM cards which are both using the Smart network. The 650-Mhz CPU is no longer impressive, especially when you’re used to smartphones with at least 1GHz speed. In fact, opening the inbox takes 2-3 seconds. then press Menu and open Settings for more options. Power consumption while on 3G is a hog. It usually drained after 4-5 hours of use even without downloads and uploads. Though, recharging this phone is fast–about an hour only. The sound from the loudspeaker is not loud. It’s tinny and that i opted to use my old phone in listening to the FM stations. Even you put the headphone, the sound from the device is not impressive. Unlike the first Glory unit that i was able to hold, my personal unit has a glossy-finish case which has bigger chances of slipping off your hands. The QWERTY keyboard in the landscape mode is not as spacious and convenient to use. I’d rather use the alpha-numeric Touchpal keypads in portrait mode when composing text. Perhaps it’s a bug. I’ve noticed that every time the unit is running out of battery and i recharge it while the 3G data connection is on, the recharging suddenly halted unnoticed. You’ll just surprised that your phone turns off. I’d observed it several times when i plugged the charger and it will recharge for a couple of minutes and stop charging. I tried again recharging the phone while turning off the data connection and this time recharging was continuous. So, Alcatel must look into this. It has no problem with recharging while Wi-Fi is on and the phone is connected to a WiFi network. There is no screen shot feature in this phone which is very essential when reviewing the performance of a smartphone. 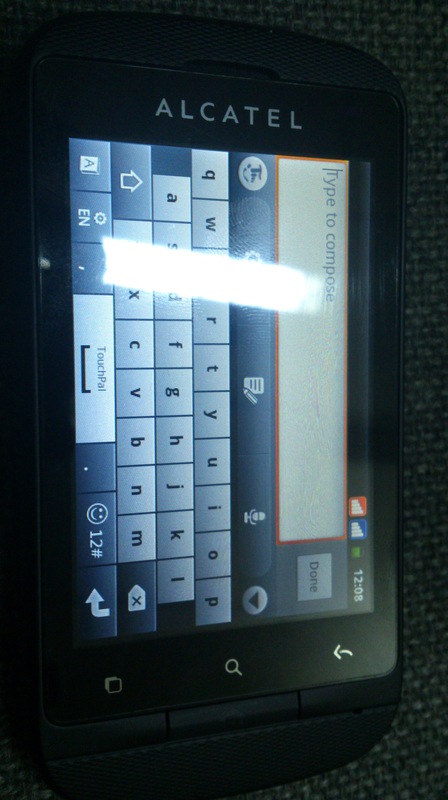 Alcatel has also failed to include the touchscreen calibration test. Maybe the manufacturer has pre-calibrated the screen before shipping it. The Glory is sporting a 3.2-Mega pixel camera which for a quite period of time had been the standard for earlier smartphones. But after testing several Xperia phones with superior camera quality, i am no longer impressed with a 3MP camera like the one in Glory. Take a peek at these samples under various lighting conditions. My Sun is on the SIM slot 1 while my PLDT is at the SIM slot 2. But everytime i got into the dead zones in the office where i could not get Sun signal, the phone won’t restart searching for cellular signal as soon as i get back to where there’s a Sun signal. I have to initiate a call on SIM 1 to regain cellular signal. This is not the usual behavior of a phone. Even the analog phone in the early years of cellular technology, allows reconnection to the network as soon as the cellular signal is available. The Alcatel One-Touch 918N Glory is an entry-level Android phone with dual-SIM capabilities. Don’t expect more than that because you’re only paying about PhP4,500 (updated latest price) for the unit. It’s a good start if you want to own an Android phone plus the convenience of dual-SIM. is there any way to open if i forgot the password or email because my son try to open and now i can’t open the browser. Please clarify. Are you referring to the browser on the cellphone? Can I use ALCATEL One-Touch 918N Glory” Dual-SIM Android Phone” in dubai using smart & sun Sim kindly reply thanks! You’ll have to arrange with Sun & Smart for roaming of your mobile subscription. While for the phone, Dubai is also using GSM. So, it’s possible to use the Alcatel phone. Based on my experience with my own 918N Glory unit, it has no setting to turn off the clicking shutter sound of the camera. how to turn off the shutter sounds of the camera??? There’s no way except to root the device. Pingback: Upgraded: Alcatel One-Touch 918N “Glory 2″ | iStoryang HaaayTek! how can i update the firmware of my alcatel (rooted) ??? How to maximize the running program when you accidentally pushed the home button? or shall i say, how to maximize the minimized running applications? The OS is Ginger Bread. So, there’s no multi-tasking here. If you want to open another application just press the HOME button. If you want to go back to the previous app, open it as usual. how to turn off the camera sound for this unit of alcatel? Based on my experience with my own 918N Glory unit, it has no setting to turn off the clicking shutter sound of the camera. One way of eliminating it is to root the unit which is not easy for ordinary users and you shall do it “at your own risk”.